(SEE AVAILABILITY ABOVE FOR ESTIMATED DELIVERY) - Patterson Medical Hand Splints - Resting Hand, Right, S, MCP Width 2 1/2" - 3 1/4", Splints Total length: 11" - Patterson Medical Hand Splints - These trim - line hand splints are made of heat - moldable Kydex plastic. The Orthowick liner absorbs moisture from the skin, helping to keep the skin dry. Liner is removable & washable. 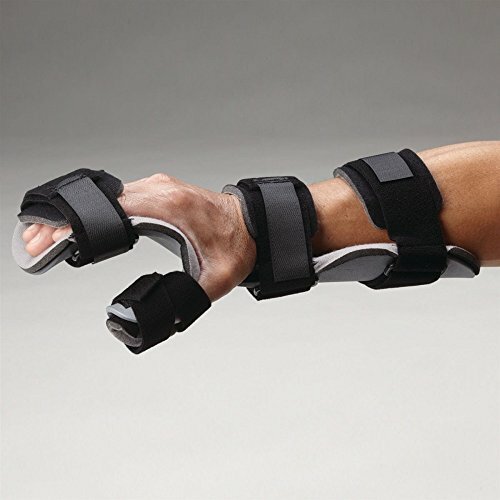 The 4 - strapping system & finger separators (included) keep fingers, hand, wrist & forearm comfortably positioned.Intrinsic Plus.Positions the MCPs in a 60° to 70° flexed angle, with the IP joints fully extended.Resting Hand Splint.Functionally positions the hand, accommodating mild to mild/moderate tone. - Rolyan products are internationally licensed & manufactured for home & clinical use. Most of their products offer a lifetime warranty.